Have you ever felt like things seem to happen exactly when you need them to? It happens to me all the time. For instance, I found this pin on Pinterest just the other day. It was an article on how to clean stuck-on food off your bakeware or pans. Crazy thing about it is that I happened to find it two days after I attempted to bake egg soufflés in our cupcake pans. While the soufflés were good, and easy to package up and freeze for easy morning breakfasts, the mess they left in the cupcake pan proved to be almost impossible to remove. I used a ton of butter to grease them, so I don’t know why they stuck so much! Next time, I’m going to use cupcake liners, but in the meantime, I was left with a mess. Well, anyway, I washed the pans by hand first, but the baked-on eggs weren’t budging. Then, I soaked them overnight in hot water and vinegar, with a little Dawn dish detergent. In the morning, they were still in pretty bad shape, so I ran them through the dishwasher. That didn’t work either. If anything, it seemed even more baked in. Cupcake Pan this morning – uhm… GROSS!! Then I saw that pin. Crazy how things just happen to show up in my Pinterest feed, right when I need them, huh? It said that you could get the dried-on, stubborn food off of bake ware by putting a dryer sheet in hot water and soaking it overnight. Well, what do you know?! 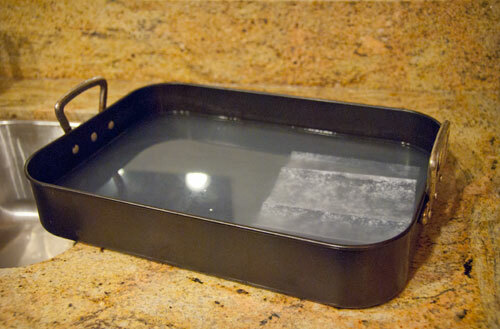 I’ve got a dirty piece of bakeware – two actually – and I’ve got dryer sheets! At this point, I would have tried anything, as they would be headed for the trash (or to the shed to be used next year to start seeds in) if I couldn’t get the baked egg off of them. So, this morning, I filled up the kitchen sink with hot water, threw in the pans and a dryer sheet and let it soak all day. 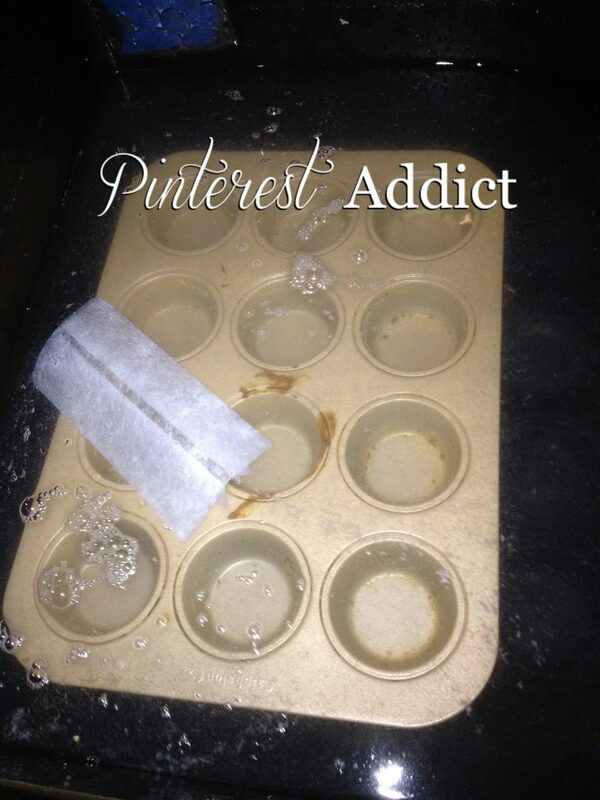 cupcake pan + water + dryer sheet = clean pans! An additional bonus to this process is that my kitchen smelled lovely all day – like fresh laundry, one of my favorite scents! When I went back this afternoon, I’ll be darned if all the crusty grossness was soft and readily wiped right off! Only a few spots were still stuck on, but with a little elbow grease, it came off too. I love it when I find something simple to fix a tough job! Have you tried any new ways to tackle a tough job? Hmmm….you think the liquid fabric softener would work too? That is pretty neat. I don’t know, but I can’t see why not. If I try it, I’ll let you know! One of the pans I cleaned today was supposed to be non-stick too, but it stuck like the dickens! I don’t usually use the cupcake pans without liners, and I never will again! What a pain in the tush to clean those little suckers out! Softener sheets and liquid softener are very toxic. 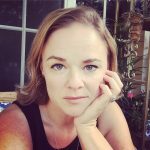 Look on http://www.ewg.org and you’ll see for yourself. I don’t use softener on my clothes and I certainly wouldn’t use it on bakeware!! I understand your concern. Rest assured that I wash the pans after letting them soak with Dawn to remove any remaining chemicals from the dryer sheets. I tried 3 dryer sheets in hot water, soaked for 3 days. the egg still did not come off. this process did not work for me!!!! I’m sorry to hear it didn’t work for you. Thank you! I use my muffin pans all the time and they are such a hassle to clean, but with this little trick, it will be a breeze, so Thank You, thank you again! 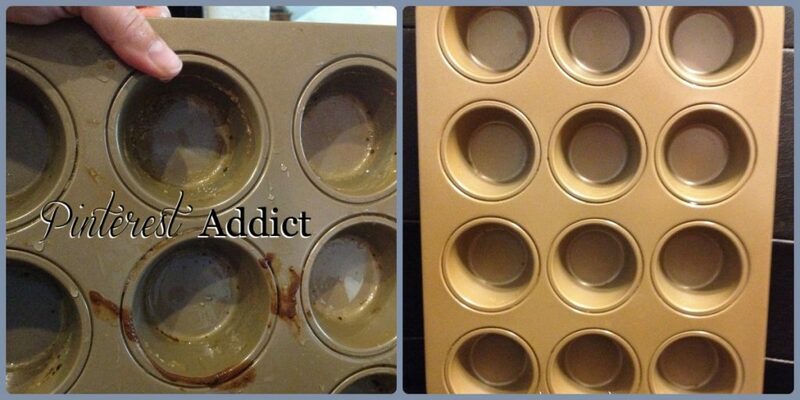 I had a friend borrow my mini muffin pan and she scrubbed it for days but it wouldn’t come very clean. She felt so bad and wanted me to buy a new one. Now I know the trick! I’ve also wet the dryer sheets and used them to scrub our glass shower door! It was like magic! Those little compartments are not easy to clean either! Do the dryer sheets get the soap scum off?? What a great idea! I I hadn’t seen that pin….but I really have dirty pans….so this is perfect for me 🙂 It was WONDERFUL meeting you at Haven. You have such a smile that makes the world want to smile along! Aww…thanks! That made my day 🙂 it wa great to meet you too. Haven was such a great experience, especially meeting other bloggers. Can’t wait for next year! Great idea! I would have never thought of doing that! I hear that dryer sheets DO get soap scum off of shower doors! Great idea! I just stumbled onto your blog ~ can’t wait to explore more of it. Oxy Clean works great! I sprinkle a little bit in the offending pan, add water and by morning it’s clean. I will try that next time, I have some Oxy Clean on hand. Every time I try to make those eggs, I get left with a mess, so i’m sure I’ll be trying it soon. Thats really impressive. Thanks for sharing. I have had a pan on my counter for 2 weeks from an unfortunate caramel burning incident. We have tried everything. .. coke, sprite, vinegar, Lemishine…. I am going to do this right now. Like you, it showed up on my pinterest at the right time! I was about to give up. Little by little it has come out but not all. Thanks so much for sharing! It was amazing! ALL of the burnt residue is GONE! It took a little scrubbing with a brush, but it was a whole lot better that when I found my husband try to scrape it off with a butter knife! Thanks for the tip! I thought it might be a lost cause. Just to let you know this did NOT work. At all. I do, however, have a really soft and nice smelling muffin tin now. And two sacrificed, soggy dryer sheets. No. Less. Gook. On. Pan. I’m sorry it didn’t work for you. 🙁 I’ve used this method a few times, always with great success. Thank you for posting this tip. I made some mini egg muffins at the weekend and they stuck like glue despite generous greasing of the pan prior to cooking. I was beginning to despair that I had ruined my muffin tin. I am going to try this today and see how it works. Thanks so much for sharing. alpacalady…I did the same thing, can you let me know how it worked for you? Awesome! I too made the egg souffle and have a muffin pan sitting on the counter for about 2 weeks now, not wanting to throw it away. Oh my gosh. I baked “make-ahead-omelets” and they stuck on the same as yours. It honestly has been sitting in my sink for two weeks because I just couldn’t make myself throw it out. I’ve been so busy to look up ways to get it off and after seeing your post finally…there may actually be hope! I’m going to definitely try this tonight. Thanks for posting this! 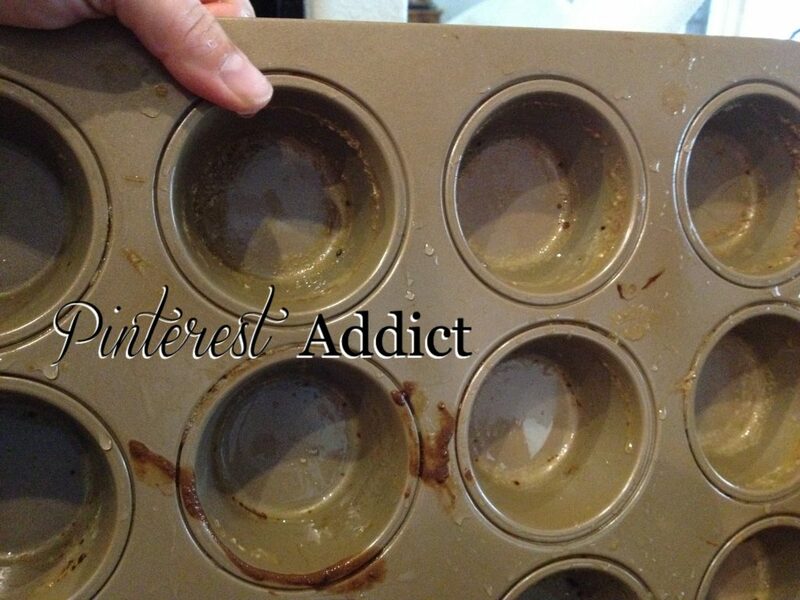 Your post is EXACTLY where I am at right now with my muffin pan!! It’s like you wrote a blog about my past week’s battle. Literally from start to finish! Well, hopefully to finish; I’m going to soak the pan with the dryer sheet now! Hi Jess – I’m not sure why it didn’t work for you. I have used this a couple of times, and it always gets the stuck on food off for me. Since I don’t know exactly what kind of grime you have, I can’t offer any advice to help, sorry! But I can say that there are a million ideas on Pinterest to help. It works! Hard to believe, but it does. I am soooo thankful to read this post. Like many of you, I made eggs in a muffin tin without a liner. Never again. I took a couple of cheap dryer sheets that I bought at Aldi. I did not let my dryer sheets soak for a long time though. Just about 5 minutes and then I decided to see if I could scrub. It worked. Now, there were a few spots that were stubborn. I just scrapped them with my fingernails and then went back to using the dryer sheets. It all came off. Thank you…thank you. I am trying to get burnt meat particles out of my nu wave non stick base. Thank you for this tip.